Imagine yourself behind the wheel of a Porsche 911 GT2 Twin-Turbo Coupe! Here are the cars most of us just dream about -- sleek, fast, fabulous machines that cost a small fortune! 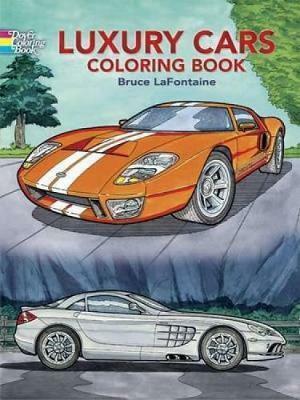 Thirty precisely and accurately rendered illustrations portray the legendary luxury cars that race through our imaginations: Mercedes-Benz SLR McLaren Coupe, BMW Z8 Convertible, Maserati Spyder 2-door Convertible/Roadster, Rolls-Royce Phantom 4-door Sedan, Jaguar XJ220, Bugatti EB 110S 2-door Coupe, and other automotive marvels. Detailed captions provide specs and other information (including top speed and acceleration time). And they come in any colors you choose to make them!